DMW Week instructors and students play on the porch for the hungry Dining Hall lunch line. There is a red button on my fiddle case with a bright yellow graphic of the palm of a hand. Above it, it reads: We Still Make Things. 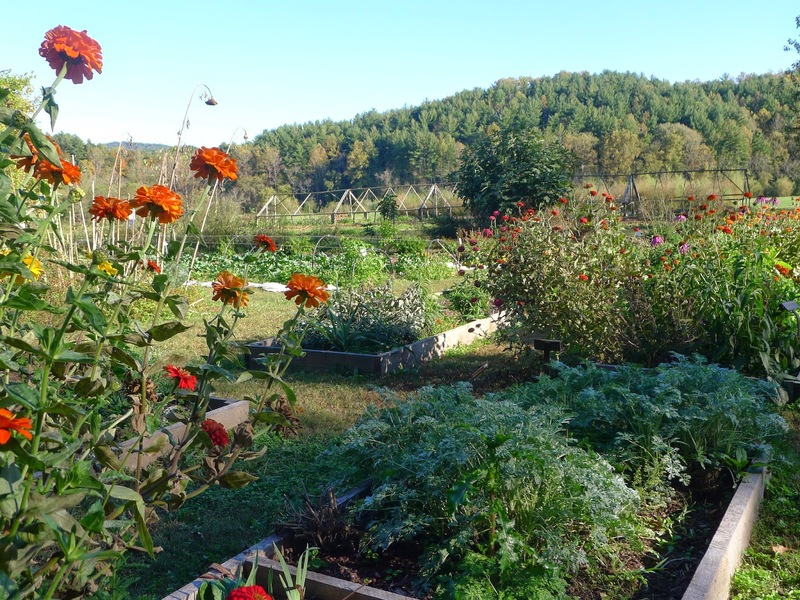 In a world of unrelenting change, the John C. Campbell Folk School still sits nestled in the mountains of North Carolina. People go there to live a little slower and make things. I am a music maker and have been for a long time – just not like this. Dance Musicians’ Week (DMW) has transformed me. I was (and still am) a music-stand-toting, note-reading player: “paper-trained,” as they say. 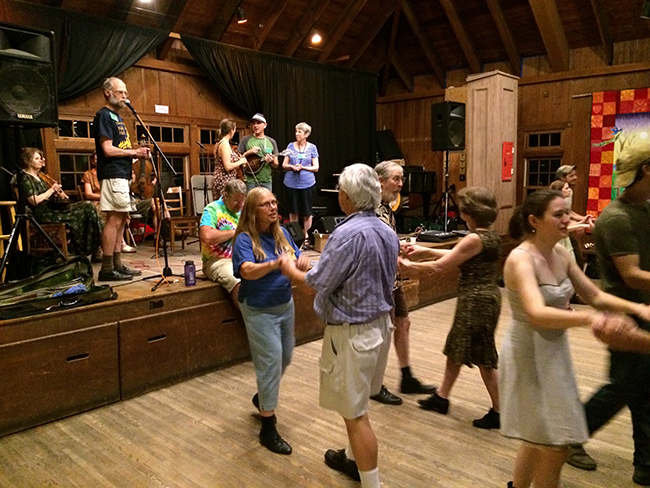 I fell in love with contra dancing and the fabulous jigs, reels, and waltzes played live at dances – and made it my goal to be a dance fiddler. With the help of DMW, now I am! As a result of this class, I can learn a tune by ear, improvise a little harmony and back up, and join in a jam. A typical day starts with pre-breakfast (optional) Morning Song and a brief presentation of some sort in the Keith House. After breakfast, the musicians’ class gathers in a big circle for a slow warm-up session on a new tune, by ear – little pieces at a time. Non-intimidating. Non-judgmental. Then we have an hour of dancing. Every move gets taught slowly before each dance. Non-intimidating. Non-judgmental. Community folks in the area stop by to dance with us because we have so much fun! The instructors play and later we discuss what kinds of tunes worked well with different dance moves… and which didn’t. 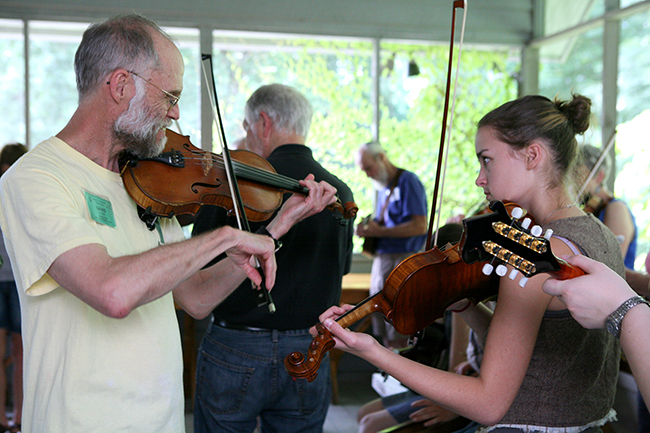 Then we break into specialized classes like fiddle classes for melody players, and harmony and accompaniment classes for “pickers” and keyboard types. 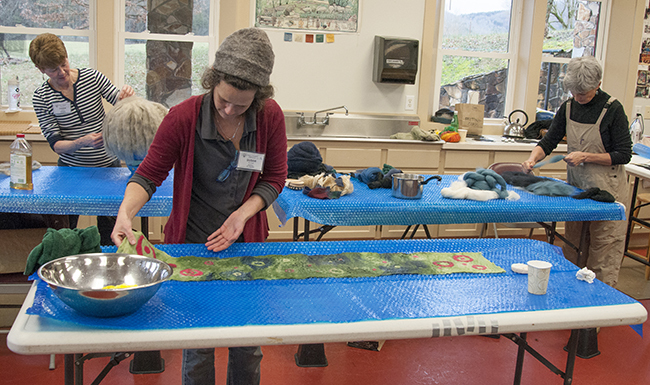 After playing tunes for the hungry lunch line, we eat healthy, delicious meals family style at large tables with other students: blacksmiths, potters, quilters, and a myriad of other crafters from all over the world. Really interesting people. 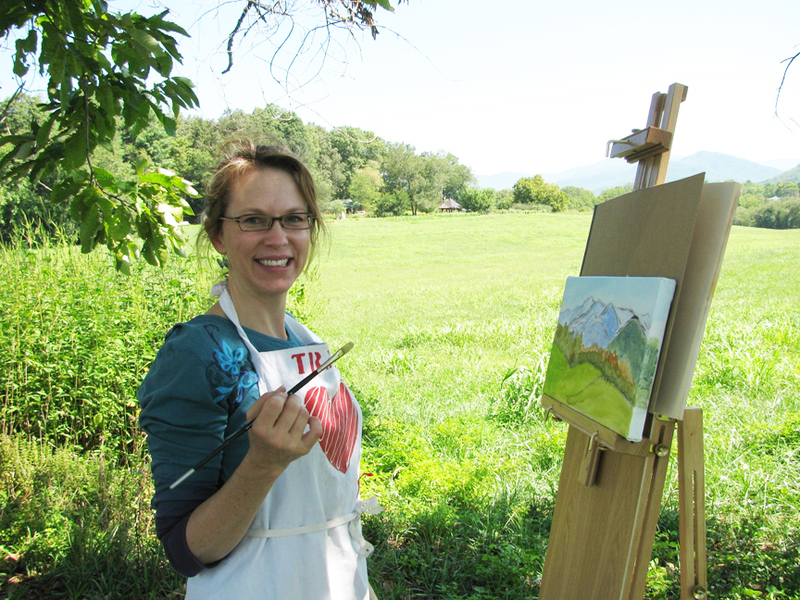 The instructors make themselves available after lunch for short, optional private lesson on a sign-up sheet. 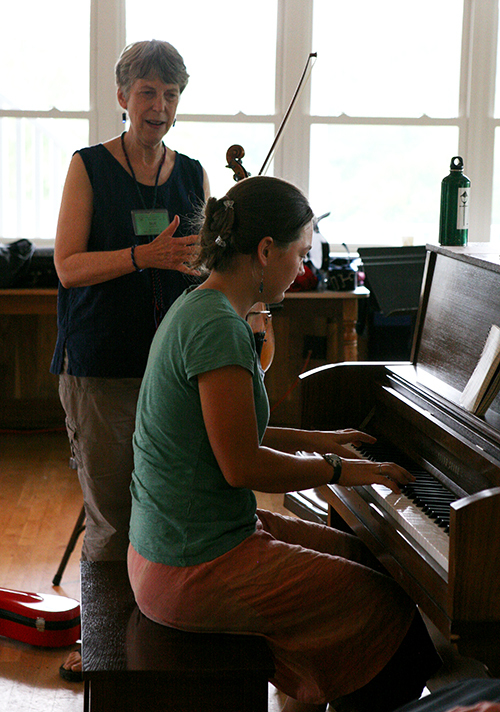 Speaking of the instructors… they are world-class musicians and world-class people. David Kaynor, Betsy Branch, Peter Siegel and Sue Songer. You can read their bios, but what that won’t tell you is how kind and supportive and nurturing they are. Non-intimidating. Non-judgmental. Topics covered in afternoon discussions include: band etiquette, sound systems, how to put together tune medleys, callers, developing community dances, etc. 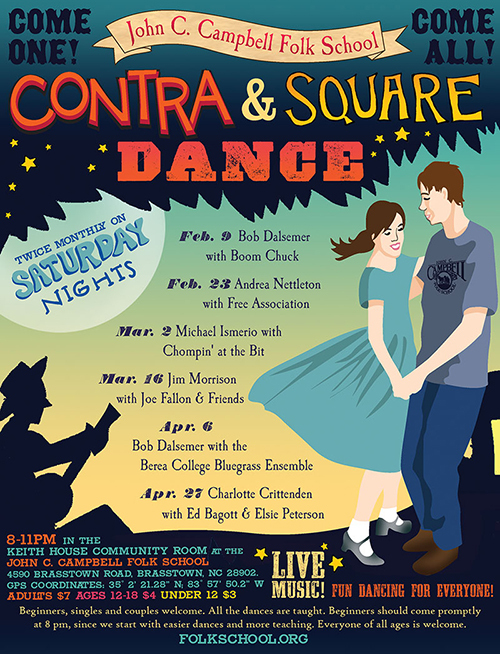 Nightly contra dances are scheduled during Dance Musicians’ Week. Then it is band time! Everyone is put into groups that practice together to prepare a tune or medley for one of the nightly dances. The instructors rotate to facilitate, encourage, offer suggestions and generally cheer us on. It is absolutely amazing – it seems impossible at first, but it always works out and we do it! 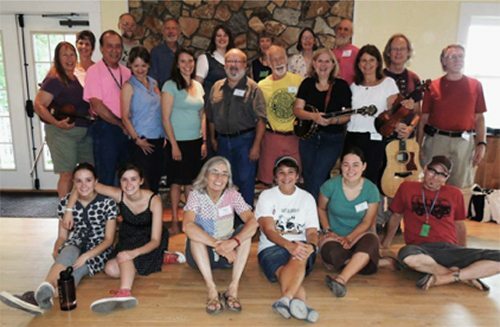 In addition to the incredible faculty and the peaceful beauty of the Folk School, the thing that makes Dance Musicians’ Week the camp I return to over and over is the collaboration and community building. No other place I know of offers support in “dance band building and development” as well as individual skills in so many areas. Whether you’re an old hand at playing for dances and just want to refine your skills and learn some new tricks – or one who plays an instrument and wants to try something different – this is the place to be. Enjoy this fun-filled week devoted to learning and improving techniques of playing and arranging music for traditional contra, square, and couple dancing. Class time includes slow-tune jams, ensemble playing, instructor presentations, tutorials, discussions, and dancing. Instructors and students also play for public dances on four nights. 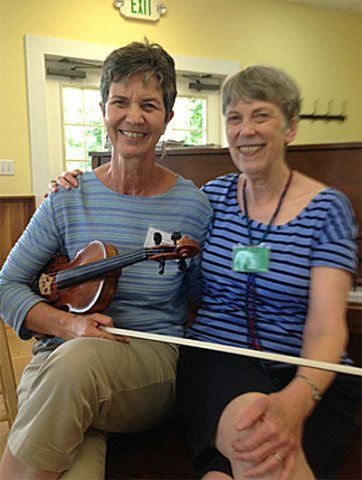 Instruction is oriented toward those who can play or accompany some tunes on their instruments and who are familiar with contra dance music (Levels 3 & 4; Intermediate to Advanced). 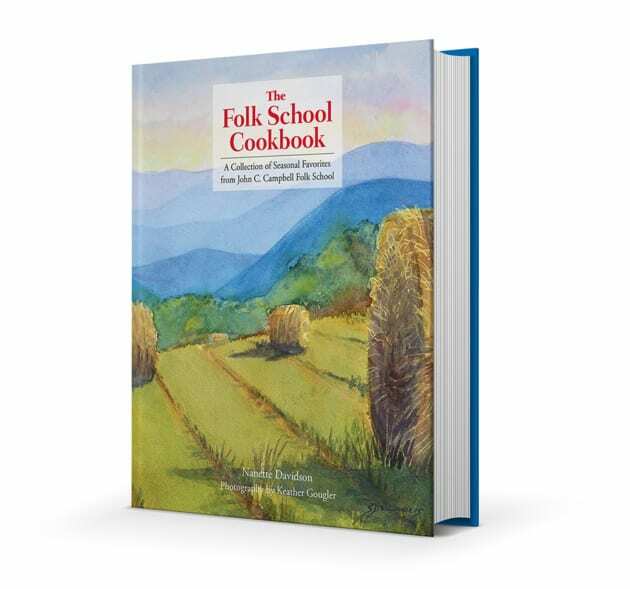 Visit the Folk School class page for more info. Enjoyed your article Sherry. Glad to see you busy in retirement.